Year 1 recapped what they had learnt about worshipping in a Synagogue today. They talked about the Torah, and the special clothes worn by the Rabbi. They really enjoyed learning about the celebration candle called the Menorah. 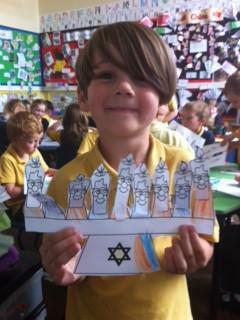 Oscar enjoyed making his own Menorah.